China is one of the most important markets in the world and one of my goals with My Day To-Do is to generate a solid active user-base in China. Lately I have doubled my my efforts to expand further into that market, that lead to this month when I (we) have had a rather significant and entirely believable spike in downloads from China. In this post I will be talking about some of the things that I (we) have done, am doing and will be doing to keep the momentum. p.s. the spike is not like 10,000 daily downloads or so but a steady stream of downloads from the region, read on to know more about the download numbers. How did China become an important market for me? China wasn’t always an important market for me, however that changed when I ran a sale on My Day To-Do last Christmas and as I have mentioned in this post, unexpectedly for me, China was the region with the highest number of downloads during that sale period. Ever since that, I have been thinking that perhaps expanding further into China is well worth the effort (it may just be that the market is not as saturated as the western market). Hmm actually I am not sure if it was her Weibo post or the Bing Ads campaign for My Day To-Do Pro that I had running at the time? I mean even though I did not generate any revenue, the Lite version was being downloaded and that was promising. On observing that, I felt that it would be really great if I could post on Weibo myself without anyone’s help, which lead to me enrolling in a Chinese language class. This made sense, as eventually I would get to point where I would know enough Chinese to communicate with my users in China. I have been learning Mandarin and Simplified Chinese (written text) for the last 19 weeks and it’s great fun. It’s very different from all the languages I know, it’s a challenge and I am have a great time learning it at UNSW. The class goes on for two hours and it’s is only once a week, so that leaves me with practicing on my own. Fortunately I live in a part of Sydney where I am often surrounded by Chinese people and I literally just talk to any random person. I start by asking them, “Do you speak Mandarin?” if they say yes, then I move on to asking them a question and then have them reply to me in Mandarin and see if I can understand it? I once asked two random blokes shopping at a supermarket as to how do I ask someone “have you had a good day?” they were kind enough to help me and they were actually very happy when I repeated 你今天过得很好吗? The Pinyin for that would be “ni jintian guo de hen hao ma?” From what I could tell those blokes were very happy with the way I was pronouncing that sentence, hence they were very happy to help. Actually this doesn’t surprise me, I mean I know for a fact that Chinese people are very helpful, I experienced that during my visit to China in 2012. I had published my first research paper for my post-graduate research and the conference was in China and I was sent to China by my university to present my paper. In China, I would often get lost trying to find my way to a particular location and end up asking people on the streets or train station for directions and I could tell that they really want to help but they just couldn’t speak English. Anyway as per that trip, I did manage to survive on my own as I quickly learned how to effectively use gestures for communication and honestly I had a great great time!!!!! I was only there for a week but I could travel on my own via public transport, find vegetarian food etc by the end of my trip. 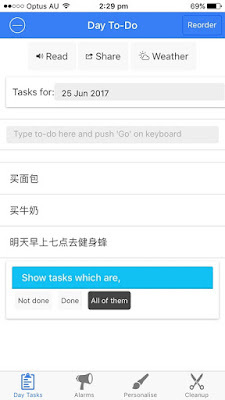 How does learning Mandarin contribute to My Day To-Do? At this stage, I am at a point where I know enough to make a list in Chinese and perhaps create a screenshot for the Chinese app store localisation. E.g. 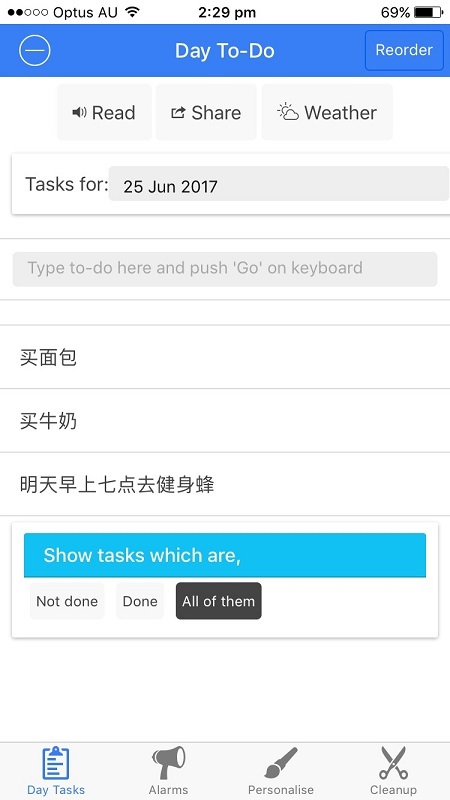 I am learning Mandarin faster than some of my peers but as far as my startup is concerned I knew that it would take me some time before I can use it beyond just making a simple list. Therefore when I was looking for a marketing intern to work on My Day To-Do, knowledge and the ability to use Chinese social media was a required. In April this year, I had a marketing intern come on-board to help me with the marketing of My Day To-Do. This was great! as for the first time in more than a year it was not just me working on My Day To-Do and what’s more, he is from China!!! Prior to my intern coming on-board I had localised all the keywords for different App Store localisations using Google Translate. So the first thing I had my intern do was to come up with the right App Store keywords, which he did. Ohh and the full name of the app on the app store also comes under the ASO category, so I asked him to come up with something better than what I had. Initially for the both versions, the Chinese name I had was something like 我的 To-Do – which is quite wrong apparently but hey that’s what Google Translate told me. So he came up with a better name and we released an update with improved localisation. p.s. how do I label the screenshots? read my post on how to label app store screenshots. 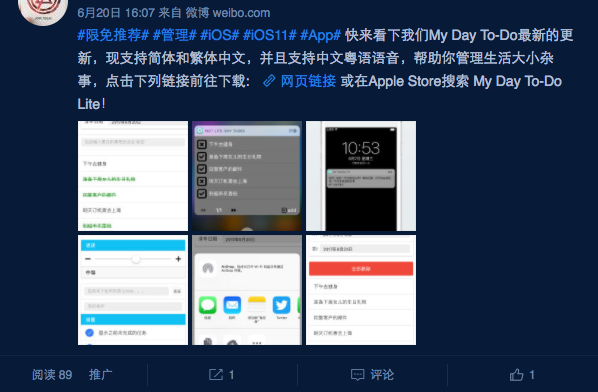 Localisation and the Weibo posts combined or not sure what? but after all this we saw a significant spike in downloads (from China: 1000+) on which I changed his work priorities. 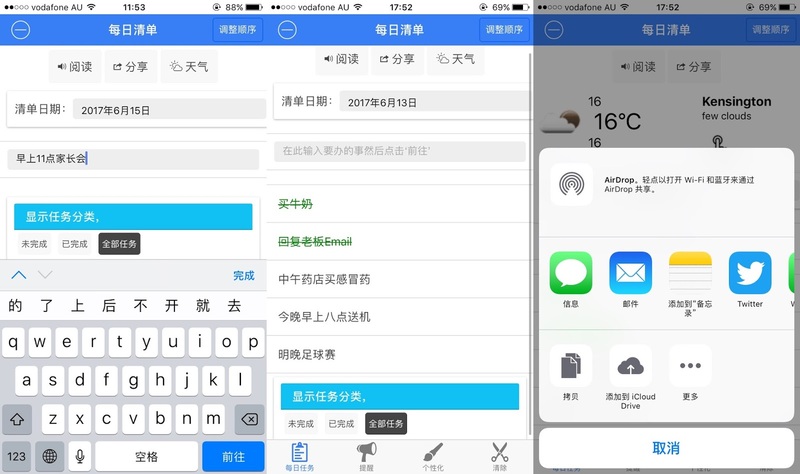 Initially I wanted him to work on creating paid advertising campaigns on Baidu or WeChat subscriptions but then I asked him to just work on getting feedback from our users. I mean we haven’t gotten any app store reviews nor have we heard anything from our users and I think we are a point where we really need to hear that before moving too far ahead. It’s important to know how our users are using the app and what can we do to make the experience better for them. I mean there’s no point in me being a nerd about it all and adding a whole bunch of “cool” new features that have me play with a variety of new tech and write ‘awesome code’ when it really doesn’t do anything for the users. 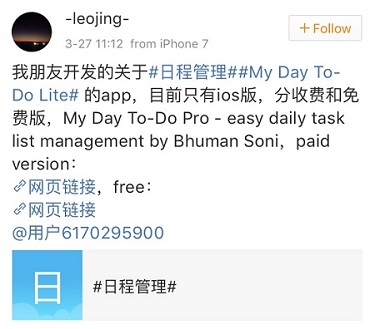 Localising the app was always lower in priority when compared to other items on the list of ‘todos’ for My Day To-Do but with the download spike from China, it just moved up in priorities. 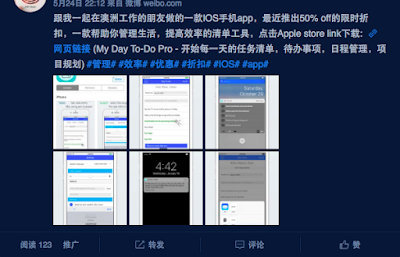 Here are some screenshots for what the app looks like when localised to simplified and traditional Chinese. I was so happy when I first saw a localised version of My Day To-Do, I mean I always wanted to localise it and now when I finally saw it happen!!! A big thanks to my marketing intern at My Day To-Do for making it all possible, none of this would have been possible without his hard work. At this stage we are just waiting to collect all the results of the survey after which we can start analysing all the data that we have gathered. My initial goal was to boost downloads for the app and now that the downloads are happening the immediate priority is to actually find out how people downloading the app are using it. I cannot stress enough, of how much a priority it is to find out just how people are using the app and that is one of the things I have asked my intern to work on. Ohh and one more thing or more like two more words: GENERATE REVENUE! Yes we have managed to boost downloads but the app is still not generating revenue and I would like that. My intern will soon finish his internship and then if we are generating some decent revenue, then I can hire some help on My Day To-Do, so it’s not just me working on it by myself. That’s all for now. I have outlined everything that I have done so far to get into the Chinese market, I am not sure exactly what worked? but something clearly has ergo the download spike so now the priority is to find out what people are doing with the app.